Cannabinoids and terpenes have been quietly entering the consciousness of consumers over the last decade or so. Research and studies have been funded and completed over the last three decades. Cannabis in one form or another has been used for the last 10,000 years, one example reaching as far back as 8000 BC in Japan. Cannabis is nothing new and neither are terpenes. However, there is some understandable confusion between the two. Most consumers are already familiar with cannabinoids like CBD, CBG, and THC; however, the rise of terpene popularity is adding a whole new collection of products to the mix. 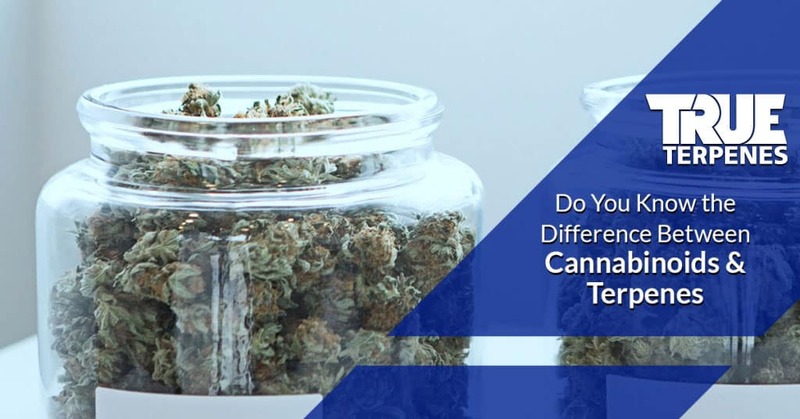 In this article, True Terpenes will explain the difference between cannabinoids and terpenes so that you can make a more informed decision on which cannabinoid or terpene product fits your needs the best. Cannabinoids are a class of chemical compounds that naturally occur in the body (endocannabinoids) and in cannabis plants like hemp and marijuana. Endocannabinoids play a very important role in helping assist your body’s ability to mitigate and manage inflammation. The CB1 and CB2 receptors are like the brakes to your immune system. As your immune system reacts to potential threats or injuries in your body, your endocannabinoids help prevent your body from doing too much good with it’s response. As a part of the Cannabaceae plant family, the cannabis plant umbrellas marijuana and hemp, as well as 170 other flowering plants in 11 known genera. This family of plants share evolutionary origins but they do not all look the same. For example, Celtis are trees and Cannabis are herbaceous plants. Each one of the cannabinoids affect the body in slightly different ways. For example, the “high” you get would get from consuming or smoking marijuana is primarily due to the THC content within that strain. On the other hand, hemp-derived products have much less THC — typically, no more than 0.03 percent THC content. The effects of CBD, CBG, and other hemp-derived cannabinoids do not offer the “high” feeling because they are not psychoactive like THC; however, they do offer other benefits currently being studied and shown effective in studies and research. Your ECS regulates physiological processes like appetite, pain sensation, mood, memory, and cannabinoids. This means that as you introduce cannabinoids into your body, they may have an affect on how your body responds to each of these types of stimuli. Some scientists and researchers pose that the ECS is the bridge between your mind and your body, the gatekeeper between consciousness and reality. Terpene isolates are products that have been extracted naturally to include a single terpene and its effects in an easy to consume liquid form. You can mix with concentrates and other sustenance like food or beverage. Depending on the effect you desire, True Terpenes offers a variety of terpenes with a wide spectrum of effects. Similar to isolates, terpene strain profiles offer a specific effect, but a strain profile is made up of multiple terpenes. For example, the blue cheese strain profile includes 21 terpenes to create the desired effect, as well as a unique aroma and flavor experience. As a worldwide leader in terpenes blends, True Terpenes offer a wide variety of terpene isolates and strain profiles to enhance your life. Our terpenes are certified natural, organic, non-GMO, and food-grade. We steam distill our terpene sources to maintain a high level of potency, as well as quality. What’s more, we consider customer service as a part of the products you purchase; it is not a separate entity. One of the biggest reasons we extract terpenes is for you. When you choose True Terpenes, you get a call or text to confirm your order, tracking information via email or text, and a follow-up call to make sure you are satisfied. Ready to enhance your life? Shop our terpenes for sale online!